Now can you guess what movie was shown at the Newport Beach Film Festival, Seattle's International Film Festival, Toronto's International Film Festival, Glasgow's Film Festival, and the 51st BFI London Film Festival? No. It's wasn't Rambo. It's this 96-minute movie made in 2007. It was Directed by Garth Jennings; and Starred: Bill Milner, Will Poulter, and Jessica Hynes. Now without beating about the bush -- THWAK! -- Young Will Proudfoot (Bill Milner) isn't anything like the French exchange student who's just recently arrived at his school, Didier Revol (Jules Sitruk). Well, not only is Will very gullible and naive, due to the fact that his Mother, Mary (Jessica Hynes), has shrouded him away from society with her hard-lined religious sect. But in addition to this, this kid also gets tricked into re-making the action film, 'Rambo', by the local school scallywag, Lee Carter (Will Poulter). OK. I must confess. This amateur production isn't one hundred percent 'Rambo'. No. Of course not. 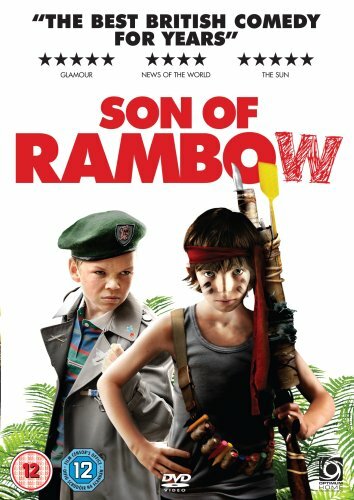 For a start, Will is playing the 'Son of Rambow', whilst Lee uses his cunning ways to shoot the film, stock the film, and... errr... find locations for the film too (like his estranged Mothers residential home, for example). Furthermore, this bodacious activity does manage to get sidetracked here and there, mainly because of Lee's misguided older brother, Lawrence (Ed Westwick), plus Will's religious guardian, Joshua (Neil Dudgeon). Still, even with these inadvertent delays, over time Will and Lee make a pact of sorts. One sealed in their own blood. Resulting in them to do whatever it is they need to do, just to get this movie made, and ready for an up and coming competition. Then again, I suppose that is why what next transpires all goes for a Burton when a flying dog gets Lee expelled. As a French exchange student gets miscast - a religious stance takes a right blast - a film ends up with a cracked spleen - and at the end of the day friendships blare out on a big wide screen. Now if a film can make me laugh, cry, and think about the true nature of existence, then in my book it is a great-great film. 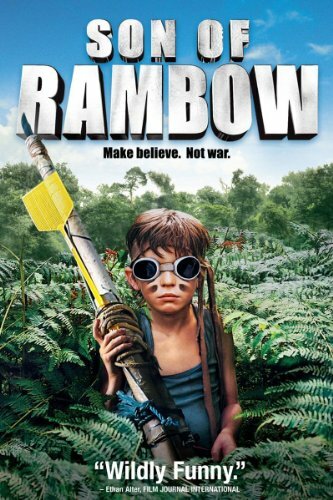 To me, 'Son of Rambow' is just such a movie. Granted, it is slow in places, meandering in others. Plus on occasion it does have that very British way of confusing the viewer with its direction and intent. Nonetheless, apart from these minor gripes, overall this flick is one to watch if you want to see two young kids make you think about what the hell life is truly all about. OK. I know that this may sound somewhat crazy when I put it in those terms. But I kid you not, folks, this production take two children from the opposite ends of the spectrum, and makes you believe in their developing friendship together, plus how they both find some common ground through a misguided filmic project. However, before I tell you exactly what I mean by this -- here -- check out these filmic-facts. (1) This £4.5 million pound adventure was first shown at the 'Sundance Film Festival' on the 22nd of January, 2007, and eventually clawed back £10 million pounds at the box-office. (2) By in large this drama was shot on location throughout the two English counties' of Hertfordshire and Kent. In Hertfordshire, you might notice: Ashridge Park in Little Gaddesden; Hawley Woods in Farnborough; plus Ashlyns School and the 'Rex Cinema' in Berkhamsted. In Kent though, you might notice 'Richborough Power Station' in Sandwich. (3) If you look very closely you might be able to spot the following cameos in this flick. Such as the wife of the director, Garth Jennings, who starred as the nurse that stitched-up Will Proudfoot's arm. 'Shaun of the Dead' director, Edgar Wright, who played the 'shop' teacher. Plus you can see the Scottish band, 'Travis', sitting down in the teachers lounge. (4) During post-production a number of items were added or changed thanks to CGI. For instance, the 'Smoking' and 'No Smoking' signs were added to the 'theatre' scene. The large 'Open 5 Days a Week' sign was included to the shop front in the 'guide dog' scene. The 'Sixth Form Common Room' sign was added into one of the many school scenes. Plus the clock time was changed upon the clock tower, because it showed the incorrect time when it was initially shot. (5) Loosely translated, this project was entitled 'Taurant Son' in Hungary, 'Rambo's Son' in Serbia; and 'Little Rambows' in Japan. (6) Apart from the obvious 'Rambo' references, there were three other filmic references scattered throughout this film. Firstly, Didier compares himself to Patrick Swayze's character from the 1983 crime-drama, 'The Outsiders'. Secondly, Lee bouncing a ball against a wall is a direct homage to Steve McQueen's character from the 1963 war-time drama, 'The Great Escape'. Plus there is a nod to Barbra Streisand's 1983 musical, 'Yentil', because its title is displayed outside the theatre. (7) Not only does this movie include clips from the popular eighties action film, 'First Blood', but it's also been endorsed by Mister Rambo himself, Sylvester Stallone. (8) The actress that won the 'Young Film-Maker Completion', Jan Pinkava, eventually went on to write and co-direct 'Ratatouille' for 'Disney-Pixar' animation. Alright. So where was I? Oh yes. 'Son of Rambow'. A great film with a great story and a great cast of actors (especially Bill Milner and Will Poulter). Well, like me, I'm sure that many of you out there must have groaned at movies starring child actors from time to time. By in large most of these staged school shindigs can be over the top in execution, and rely heavily on the 'cute factor' to override conventional common sense. But not in Bill and Will's case. No Sir-re Bob. These two kids were just magical in this piece. Because both of them staked their ground -- one was the naive simpleton, whilst the other one was the urban wise-guy -- and propelled this flick into the hemisphere like a flying dog perched in a hang glider. Moreover, another thing I just loved about this film, was how the supporting cast really did support (particularly Jessica Hynes and Neil Dudgeon). As well as how those child-like special effects and cartoon-like stunts gave the narrative those extra special touches (like a tiny umbrella stuck in a drink). On the reverse side of this though, I'm not really sure how to judge the 'religiosity' within this project. Now I'm sure that many bible bashers would say that it wasn't depicted in a very good light, and that it just showed the bad side of communal worship. Yet, to contradict this point, I suppose this stuff does happen on occasion, and sometimes people who follow faith do shy away from a more urban type of society. Anyway. I know I could go on. But I won't. No. By now I'm sure you can tell that I loved this film, and thought that it was just brilliant in most departments. 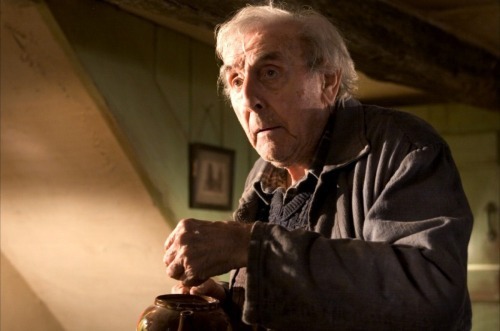 So in closing this review, it would be my supreme honor to dedicate it to the memory of Erik Sykes, who made his last screen appearance in this movie. Rest easy pal. Your last film was a smash. Nuff said.